The EU on Thursday condemned Venezuelan President Nicolas Maduro's new term of office as based on "non-democratic elections" and warned it was ready to impose fresh sanctions if Caracas further undermined democracy or human rights. Firebrand socialist leader Maduro hit back demanding "respect" from Brussels, which has repeatedly criticised the election that returned him to power. The EU and its 28 member states shunned Maduro's inauguration to a new six-year mandate on Thursday, as did most Latin American countries. Speaking for the European Union, a statement by the bloc's diplomatic chief Federica Mogherini said the result of May's elections "lacked any credibility" and she condemned Maduro for ignoring international calls for new polls. "President Maduro is today starting a new mandate on the basis of non-democratic elections," the statement said. "This only pushes further away the possibility of a constitutional negotiated solution while the political, economic and social situation in the country keeps getting worse and the impact of the crisis in the stability of the region is increasing." Maduro, the handpicked successor of the late leftist strongman Hugo Chavez, responded during his inauguration speech with a warning of his own. "Respect Venezuela, or history will make you pay for this debt sooner rather than later," he said. "European Union, stop! Don't come here with your old colonialism, don't come with your old aggressions... with your old racism." Maduro was re-elected in polls boycotted by the majority of the opposition and dismissed as a fraud by the United States, European Union and Organization of American States. His first term saw an exodus of millions of people escaping an economic meltdown that has plunged much of the oil-rich country's population into poverty, suffering desperate shortages of basic foods and medicines. The International Monetary Fund predicts that Venezuela's economy will shrink by five percent next year, with inflation hitting a staggering 10 million percent. Maduro's inauguration took place in the Supreme Court rather than the sidelined, opposition-controlled parliament, which has refused to recognise him. 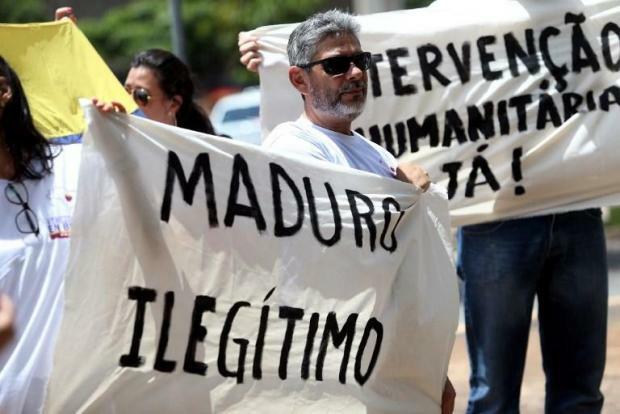 The EU has imposed sanctions on Venezuela over rights abuses, including an arms embargo and travel bans and asset freezes targeting 18 members of the Maduro regime. Mogherini warned the bloc was ready to take further steps if matters got worse. "The EU will continue monitoring closely developments on the ground and stands ready to react through appropriate measures to decisions and actions that further undermine the democratic institutions and principles, the rule of law and human rights," she said in her statement.